Alex Lewis of Greenwich swims the butterfly leg in the 200 Medley Relay event during the boys high school swim meet between Greenwich High School and Fairfield Prep at Greenwich, Saturday, Jan. 11, 2014. 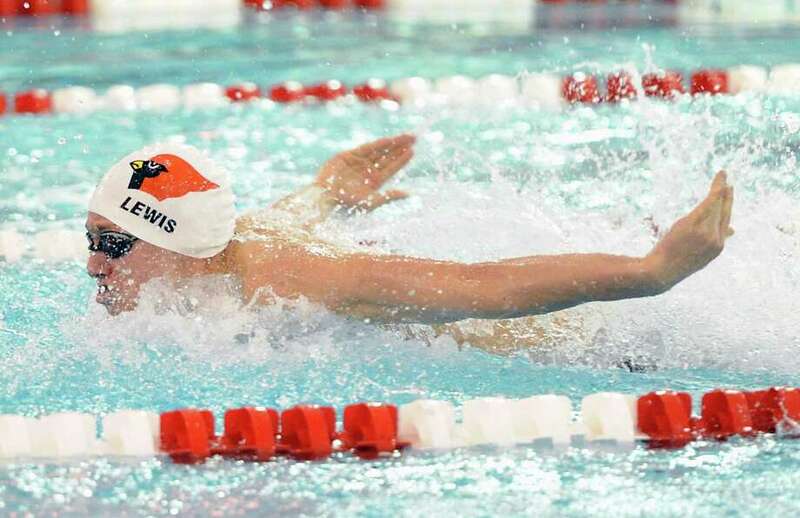 GREENWICH -- "Wow" -- that was the first word out of Greenwich High School boys swim coach Terry Lowe's mouth following the Cardinals' much-anticipated showdown against rival Fairfield Prep Saturday, and rightly so. From the 200-yard medley relay to the meet's final event -- the 400 freestyle relay -- the times both teams registered were reminiscent of the performances usually seen at the State Open in March. Indeed, both teams are well ahead of schedule, especially defending State Open champion Greenwich, which remained undefeated with a convincing 116-70 victory over Fairfield Prep before a packed house at GHS. The Cardinals (5-0) won 11 of the 12 events, including impressive victories in the relays. "Wow, 1:35 in the opening relay (200 medley relay) wins states almost every year and the same with the 200 freestyle relay," Lowe said. "Both teams had to be really pleased with the times. To swim like that this time of year is amazing." Senior Alex Lewis and junior Thomas Dillinger each had first-place finishes in two individual events and were part of a pair of winning relays for Greenwich. "To be honest, we live for the competition we receive in this meet," Lewis said. "No other opponent is as strong as Fairfield Prep, they matchup evenly with us in almost every race. We get pumped up when we face them and this win gives us a great feel for where we stand." The Jesuits, who lost to the Cards 96.5-89.5 last season, were paced by Bryce Keblish, who placed first in the 200-yard individual medley (1:56.93) and tied Greenwich's Jack Montesi for the top spot in the 100 butterfly (51.37). "I am thrilled with our performance," said Fairfield Prep coach Rick Hutchinson, whose squad placed second at the State Open last winter. "These were the best times we've done all year and some of the fastest times we've had in a dual meet in school history." The Cardinals foursome of Montesti, Iain Edmundson, Lewis and Ed Moss began the meet by winning the 200 medley relay in a blistering time of 1:35.27. Dillinger followed by touching the wall first in the 200 freestyle (1:43.26). Nicholas Wargo of Prep was the runner-up (1:45.64). "I know Nick is a very good swimmer, so I had to take it out fast and maintain," said Dillinger who placed second in the event at the State Open a year ago and also won the 500 freestyle Saturday. "The practices we had before this week were limited due to the weather, but we made the most of what we had and that's why we performed really well today." Keblish gave the Jesuits a lift in the 200 individual medley and was involved in one of the most exciting events -- the 100 butterfly. Edmundson was the runner-up to Keblish in the 200 IM. "I knew the guys I was going to be racing, I've raced them in club swimming and high school swimming before, so I knew it was going to be tough," Keblish said. "I tried to work my backstroke, which was the difference in this race. For the most part, I put together four great splits." In the 100 butterfly, Montesi and Keblish were neck-and-neck the final two laps. "You don't see ties very often," Keblish said. "It's always fun to have races like that, it makes meets like this special." Greenwich began pulling away with a 1-3-4 finish in the 50 freestyle and a 1-2-4 showing in the 1-meter diving event. Moss, the defending State Open champion in the 50 free, won the event in 21.01. He captured the Open title last winter in 21.21. "Moss at 21.01, holy cow, what a time," Lowe said. "Our times today were astonishing," said Moss, a junior. "We really stepped it up and proved we are the best team. Last year, we beat them by less than 10 points, so this really shows the improvement in our team." Lewis' individual wins came in the 100 freestyle (46.17) and 100 backstroke (54.76) -- an event he holds the state record in. Bjorn Davis took second in the 100 freestyle and Montesi was the runner-up in the backstroke. "The 100 freestyle I felt an incredible adrenaline rush," Lewis said. "After Jack (Montesi) tied Bryce (Keblish) I told myself I had to follow up with a great swim." Andrew Bologna (diving, 234.10) and Edmundson (1:00.63) also won their respective events and the 200 freestyle relay squad (Wurst, Julian Fraser, Moss, Dillinger) touched the wall first for the Cards, who led 51-27 after diving. The 400 freestyle relay squad of Ben Wurst, Montesi, Dillinger and Lewis, edged Prep for first place with a time of 3:11.35. The Jesuits touched the wall in 3:11.61. Anchoring the relay, Lewis came from behind the final lap, giving GHS the win. "I was about two or three seconds behind, so I knew I had to dig deep," Lewis said. "I was like, `I'm not losing,' and had to really kick it into gear." 200-yard medley relay -- 1. Greenwich (Jack Montesi, Iain Edmundson, Alex Lewis, Ed Moss) 1:35.27; 200-yard freestyle -- 1. Thomas Dillinger (G) 1:43.26; 200 individual medley -- 1. Bryce Keblish (FP) 1:56.93; 50 freestyle -- 1. Ed Moss (G) 21.01; Diving -- 1. Andrew Bologna (G) 234.10; 100 butterfly -- 1. Jack Montesi (G) and Keblish (FP) 51.37; 100 freestyle -- 1. Alex Lewis (G) 46.17; 500 freestyle -- 1. Thomas Dillinger (G) 4:50.13; 200 freestyle relay -- 1. Greenwich (Ben Wurst, Julian Fraser, Ed Moss, Thomas Dillinger) 1:26.89; 100 backstroke -- 1. Alex Lewis (G) 54.76; 100 breaststroke -- 1. Iain Edmundson (G) 1:00.63; 400 freestyle relay -- 1. Greenwich (Ben Wurst, Jack Montesi, Thomas Dillinger, Alex Lewis) 311.35. Records: Greenwich 5-0; Fairfield Prep 3-1.